Can Guinea Pigs Eat Tomatoes and Tomato Plant? 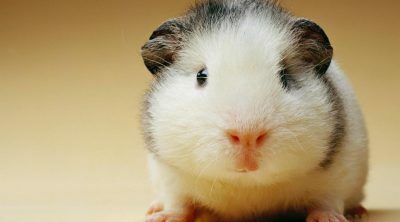 Who does not love these cute little fur balls we call guinea pigs? Every child would love to have this kind of play partner and we can surely understand why! The downside with these pets is that we have to be very careful about what we are giving them to eat. Can guinea pigs eat tomatoes, for instance? 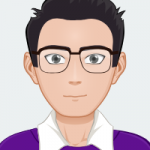 Many owners have surely wondered about this question and in this article, we have provided the answers. Read more to find out! The fact that we love eating tomatoes and they bring a great amount of health benefits to us, humans, does it mean that they are as great for our little pets as well? 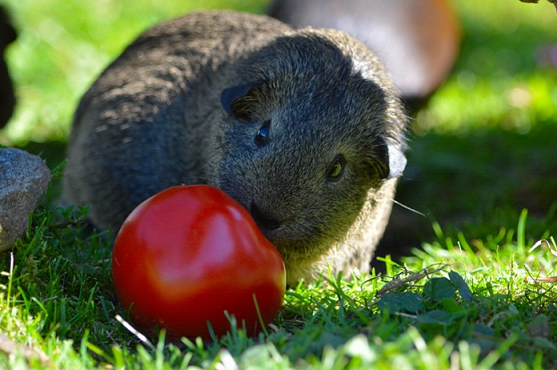 Yes, guinea pigs can eat tomatoes but only in moderation. However, unripe tomatoes are not recommended for guinea pigs. Unripe tomatoes contain solanine and tomatine which are toxic to cavies. Tomatine can also be found in ripe tomatoes but in small amount only which doesn’t pose any risks to guinea pigs. 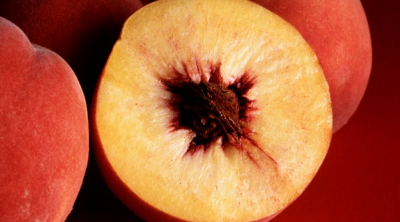 Just remember that fruits are high in sugars, and tomatoes are no exception. Too much sugar will cause digestive issues and diarrhea. When you add tomatoes or other fruits to your cavy’s diet, make sure to do it in moderation (a couple servings a week should be fine and more than that wouldn’t even be necessary). So, if you have some fresh tomato leftovers from a meal, feel free to share it with your small furry friend! However, tomato leaves and plant itself are not safe for cavies. These are quite poisonous to your furry family members. Also, make sure that your leftovers don’t contain any spices, mayonnaise or sour cream. Plain, fresh tomatoes are best for guinea pigs. Tomatoes are known to be great for cardiovascular support and bone health. They also possess anti-cancer benefits, especially prostate cancer, breast cancer, pancreatic cancer and non-small cell lung cancer. Other benefits tomatoes may hold have been linked with reduced risk of some neurological diseases (including Alzheimer’s disease). Tomato-containing diets have also been linked to a reduced risk of obesity. The fruit part of the tomato is safe as long as you remove the green part of the tomato plant as it can be toxic for your cavy friend. The leaves and the stalk are poisonous. So, be very careful and make sure you remove them before feeding it to your guinea pig. Otherwise, your pet may get very sick. If you grow your own tomato plants, make sure that your guinea pigs don’t have any access to these. They might start munching on the plant. Additionally, wash the fruit very well, as the peel might contain some impurities that might interact with the health of your guinea pig. It’s also recommended to feed organically grown tomatoes to your guinea pigs. 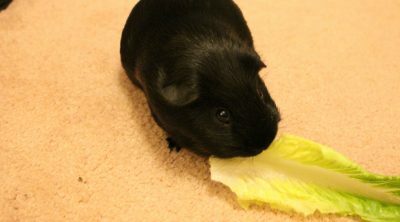 Pesticides and other chemicals are harmful for guinea pig’s delicate digestive system. The last thing you would want is to have a sick pet, right? If you can’t buy organic ones, you can wash the tomatoes thoroughly with apple cider vinegar. This way you will eliminate pesticides as well. When it comes to the actual fruit, tomatoes are great for guinea pigs and they can be included in their diet. Tomato treats can be a wonderful variation that would break the routine of foods your pet eats. They will also offer a new taste and provide nutritional components to your piggy’s needs. So, we thought it would be useful to offer you the details about the nutritional content of this red and juicy snack. Take a closer look and see for yourself how amazing tomatoes actually are! The tomato fruit contains a total amount of carbohydrates of 5.8 grams. It also includes protein, some sugars, and dietary fiber. It has 0% starch and selenium, but it is high in vitamin C and vitamin A. In what concerns the minerals, tomatoes contain manganese, copper, fluoride, zinc, sodium, potassium, phosphorus, calcium, magnesium and iron. Vitamins K, E, B12, B6, folate, niacin, riboflavin, and thiamine are also included in this red fruit. 1 cup of tomatoes contain 32 % of vitamin C which is absolutely wonderful for your furry buddy! Guinea pigs’ bodies are unable to produce vitamin C on their own, so it is crucial that they get it from the foods they eat. The downside is that tomatoes also contain sugar, which can have damaging effects on your piggy’s tummy. You can add tomatoes to their diet, as long as they are fed in moderation. Wondering what is the serving for this food? Experts say that one small serving (1 cubic inch) twice a week is more than enough for them. What you should remember is that the most important food for guinea pigs is and should remain vitamin C fortified pellets and quality hay. Fresh water should accompany both of them. Coming back to the original question, yes guinea pigs can eat tomatoes, but like any other veggies or fruits they consume needs to be in moderation. Giving tomatoes to your cavies sparingly can add the nutrients they need to their daily diets and avoid any unpleasant consequences that might affect their overall health system. Fresh fruits and veggies provide your guinea pig with a wide range of vitamins, minerals, fiber, and other nutrients. Additionally, they make your pet’s diet more interesting by providing many different textures and flavors. There are many human foods that are suitable for guinea pigs to eat. 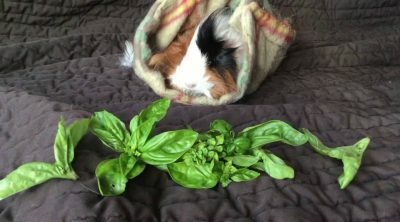 You can browse our website for different plants, fruits and vegetables that you can give to your cavy. You can feed some foods daily, whereas others, that contain high levels of starch and sugar, should only be fed occasionally as a rare treat. 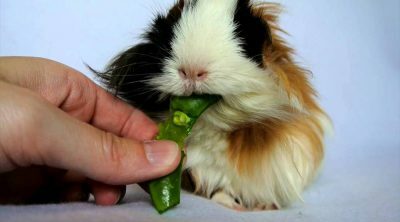 Additionally, make sure when you introduce any new foods to your cavy, do it very gradually and in small quantities. You don’t want to upset your pet’s digestive system. 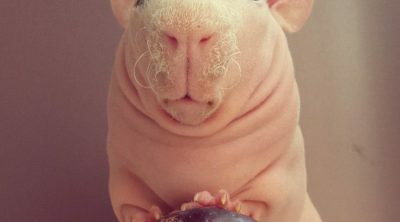 After feeding new treats to your guinea pig, observe your pet carefully. If your cavy doesn’t show any unusual behavior or loose stool, you can continue feeding him the food. However, if your pet experiences diarrhea or other digestive discomfort, you should stop feeding him the food immediately. Also, it’s best to consult with your veterinarian first when wanting to introduce any new foods to your guinea pig’s diet.